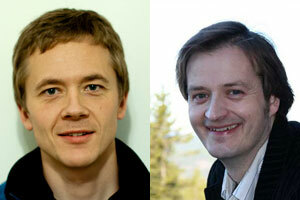 Magnus Løberg and Michael Bretthauer from the Department of Transplantation Medicine at Oslo University Hospital are first and last author respectively on an article recently published in New Eng J Med (journal impact factor 54.42), entitled "Long-Term Colorectal-Cancer Mortality after Adenoma Removal". Taking advantage of nationwide data in the Cancer Registry of Norway on patients who have had colorectal adenomas removed, they have evaluated colorectal-cancer mortality in a large, population-based cohort with virtually complete follow-up for death from colorectal cancer. The findings are commented in an editorial in NEJM. Their finding that the removal of low-risk adenomas reduces the risk of death from colorectal cancer over a period of 8 years to a level below the risk in the general population is consistent with the hypothesis that surveillance every 5 years after removal of low-risk adenomas may confer little benefit over less intensive surveillance strategies. Furthermore, complications associated with colonoscopy are not trivial and might offset the benefit of surveillance. Løberg M, Kalager M, Holme Ø, Hoff G, Adami HO, Bretthauer M.
N Engl J Med. 2014 Aug 28;371(9):799-807. Editorial in NEJM about the findings: Colon-Polyp Surveillance - Do Patients Benefit?